Cyberhawk 200M™ submeters are revenue grade* Multiple Meter Units (MMU). These meters monitor energy, power and power quality, include digital inputs to count pulses from external water, gas and other meters, and have user configurable alarms. 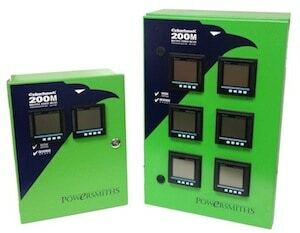 Configuration options for integrating up to six (6) meters in one enclosure save space and cost. Enables browser-based remote access to live data and trend logs.